In Indonesia, a family keeps the mummified corpse of a beloved grandfather for seven years, dressing it each morning and putting it to bed with the children at night. In a tiny town in Colorado, friends and family lay boughs of juniper atop a body and watch it burn on a ceremonial pyre. And somewhere in the mountains of Tibet, a corpse is chopped and pounded by hand before being offered to shrieking vultures. Mortician and writer Caitlin Doughty challenges everything we’ve been taught about caring for our dead. Her first book, Smoke Gets in Your Eyes and Other Lessons from the Crematory, decried the way Americans have outsourced their death traditions to the corporate funeral industry. 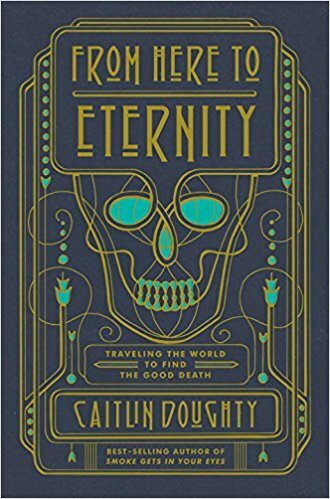 In her thought-provoking and entertaining new book, From Here to Eternity: Traveling the World to Find the Good Death, she invites us to join her in observing death rituals in other countries. The book is part travelogue, part meditation on mourning—often wildly funny but occasionally quite poignant. Doughty writes with tremendous wit. Between vivid depictions of funerals, cremations and decomposing bodies, she offers observations on family, community, and the controversial role of women in death traditions. Caitlin Doughty spoke to me as she was getting ready to head off on her book tour. Your book is subtitled, Traveling the World to Find the Good Death. What led you to embark on this trip? If you know me and what I work on, you know that I have a bit of a fraught relationship with the American funeral industry and I think we’re not doing the best for our families. We’re not offering enough options when someone dies. What I went looking for is proof that around the world, there are places where there are beautiful rituals and really moving ceremonies and ways of taking care of the dead bodies. You might think, ‘’ooh, that’s disrespectful and disgusting,” but if you’re [watching], you can see the humanity in them. I wanted to show people that how we do death in America is not the be-all and end-all. We can do more, and we can do better. What do you mean by ‘the good death’? The good death is a bit of a complicated term. For me, it’s about the overall death experience, including what comes after the death. I’ve always said, ‘I’m a corpse girl.’ There are people who do amazing work on end-of-life, or grief and grieving, or memorialization. But what I’m interested in is what the family does with the dead body—how it’s disposed of, how the funeral goes, that sort of thing. Let’s talk about one of the rituals you observe in this book—one that Americans, at first blush, might consider primitive or savage—which you found to be genuinely useful to the family and the community. There’s a very, very rural area of Indonesia that I call the Holy Grail of corpse interaction. There’s no other place in the world right now where they interact with the dead body for such a long period of time. In Mexico, they’re well known for going to the cemetery, speaking to the dead, and bringing the dead offerings for years after a person dies. But in Indonesia we’re talking about the actual corpse. We’re talking about a family keeping the mummified corpse in the house for two years, four years, even seven years, while money is being raised for the funeral. Eventually, the body will be put into a grave in the village. But later, during a special ceremony, the family will take the body out again. They’ll welcome it back into the world, and they’ll clean and re-dress it. They’ll take pictures of it, give it updates on the village, talk to it and whatnot. Why would a community put so much energy into its dead? My friend Paul [“scholar of the macabre,” as he’s referred to in this book] says that in America, we see death as a hard border. When someone dies, you put the body in the ground, or in a cremation machine, and it’s over. You can think about that person fondly, but they’re dead, they’re gone. Whereas in many countries, death is a soft border. And if you have that perspective—that a person is still present in the body after death—it changes how you’re going to treat the body. Years after someone has died, you can still have a conversation with that person—and not in a say-a-prayer-to-them way, but in a 100%, I’m-standing-here-with-your-mummy-and-having-a-conversation-with-you way. You speak to that person through the conduit of the mummified body. And that person can say, wow, what an honor that my family is still bringing me cigarettes and food offerings and changing my clothes. Isn’t it beautiful and powerful that my family still does this for me? In your mind, what makes this ritual beautiful? Does it help strengthen the bonds in a community? Absolutely. It kind of goes without saying that in America, we have a culture that doesn’t celebrate the elderly, or our ancestors, or our dead. We hide our elderly away in nursing homes. We want them to be out-of-sight, out-of-mind, because we revere youth. But there are cultures where the elderly are seen as a source of wisdom in the community, and after death they’re still consulted. It’s a different relationship with age and with death. You talk a lot in this book about women and their roles in death traditions. In America, as recently as 100 years ago, women were the ones who were taking care of the body after a death. And then—[with the rise of the funeral industry]—women were told, “No, this isn’t a job for you. This is a job for the men, and you’re supposed to pay us for it.” So a lot of women said, “Wait, what happened? We want our corpses back!” I think that’s great, and I think the more that women speak up and demand that, the more it’s going to happen. In Bolivia, you observed a ritual in which human skulls—ñatitas—are accorded certain powers to grant wishes. And women are the keepers of these skulls—cleaning them, decorating them, allowing others in the community to make offerings to them in exchange for favors. Can you talk about how this tradition jives with the traditions of the Catholic Church? You know, the Catholic Church isn’t particularly happy with these women. I think this is about power, and access to the divine. What these women are saying is, because I have these skulls, which are connected to great power—I can go directly to the divine and ask for favors; for help in love, or finances, even safety and protection. Maybe I don’t need a priest to be my interceptor, maybe I don’t need the structure of the Catholic Church to intervene for me. And obviously, that’s going to be really threatening to the church, which says, “we and our male priests are the real connection to the divine.” For a woman to say she’s going to do this on her own is a transgressive thing. You spent time with the Urban Death Project in North Carolina, where researchers are studying how to return the human body to soil. (You pointedly refer to this process as “recomposition,” noting that the term “human composting” would not be a wise public-relations move.) You write that for a woman, choosing recomposition is a somewhat radical act. I think that women are made to feel like they need to be contained, they need to be tidy. And they can’t be too fat, and they can’t be too loud, and they can’t be free sexually. There are all these subtle cultural pressures on a woman’s body as she moves through the world. And something about decomposition just throws all those rules out the window. Choosing this means being able to be laid into the ground, getting gross, getting messy, getting bloated, and going back into the earth. And there’s a real power to letting that happen to your body, a real “eff you” to the forces that try to control women in life. You describe contemporary American society as being in “death denial.” Do you see any connection between denial of death and denial of nature? Oh, absolutely. The fact that when somebody dies, we chemically preserve them, and put them in a sealed casket, and put that casket in a concrete vault, and then put it all underground—I mean, do we need that level of protection for the dead body? Isn’t the body designed to decompose, to go back into the earth? Isn’t that what we’re supposed to do? I think these practices are incredibly connected to our desire for control, as well as a fear of nature and the natural cycles of destruction and decay. This book offers a wonderful smorgasbord of rituals from around the world. Are there any that you think are most likely to be adopted in the United States? Any you’d most like to see adopted? Being in Japan was interesting, because it brought home the two biggest fears the American funeral industry has—one, letting people be involved with the dead body, and two, the use of technology. It shows what the American funeral industry could be if we chose to go in that direction. The first place I visited was called the Ruriden columbariam. When you walk in, the walls—360 degrees around you—are lined in crystal Buddhas that light up in different patterns. And when you want to find the ashes of your dead person, you scan a smart card, and the Buddha with your person’s ashes behind it start to glow in a different color than the other Buddhas. You just feel swaddled in this place, it’s so beautiful and lovely. You also describe a beautiful funeral home in Yokohama where families can spend time with a body before it’s cremated. That’s my favorite! The corpse hotel—the last hotel you’ll ever stay in! So, for people in Japan, being with the body of a loved one is a really important aspect of death. And because there’s a shortage of crematories in Japan, there can be a bit of time between death and disposition of the body. This place not only has cold storage for bodies, and staff that’s always ready to help, but also, private rooms where families can go to be with their loved one. And if there are family members visiting from out of town, they can rent a whole apartment, which has futons, a bathroom, a kitchen with microwave, etc. The body will be brought into the apartment, and everybody in the family can spend time with it in this slightly mediated environment. It’s a brilliant idea. Can you talk about the experience of sitting with a dead body? Why do people do this? If you ask me why I think it’s important, psychologically, to sit with a dead body, I’ll give you three reasons. First of all, when you sit with the body of a person you’ve loved, it’s clear that the person isn’t here any longer: they’re gone, they’ve left the building. And you have to start integrating that into your reality. The second thing is that being with a dead body reminds you that you too will die one day, and it gives you a moment to think about your own death. And the third thing is that it allows you to be in this space of death, where you can think about all the people you’ve lost in your life, or all the people who’ve died around the world. It gives you a safe space to feel grief and to mourn, basically, for humanity. One of the most poignant stories in this book focuses on your friend Sarah, who’s Mexican by heritage but who grew up in the United States. When Sarah was six months pregnant, her baby died. Could you describe what she experienced in this country, and what she later experienced after moving back to Mexico? Sarah is the perfect example of someone who was really chewed up and spat out by our discomfort with death in the United States. When her child died, she felt like she couldn’t talk to anyone about it without making them uncomfortable, or freaking them out and making them distraught. All she really wanted to do was publicly mourn and talk about her child. Because when you’re pregnant, all you want to do is talk about your child and share your excitement. And when, all of a sudden, that rug is pulled out from under you, not only do you not get to share your happiness, but you’re not allowed to share your sadness either. She searched the internet, looking for support groups for people in her situation, but all she found were people who that said things like, ‘God has a plan for your little angel’—words that she couldn’t relate to at all. So she went back to Mexico, and there she found a culture where you can very, very openly grieve for your child. Every year you go to the cemetery for Días de los Muertos. You get to build an altar, which is a physical ritual, and bring flowers and food. You get to engage with your grief in a very public way. Her experience in Mexico didn’t heal her, but it did make her feel heard and seen in a way that never happened in the United States.